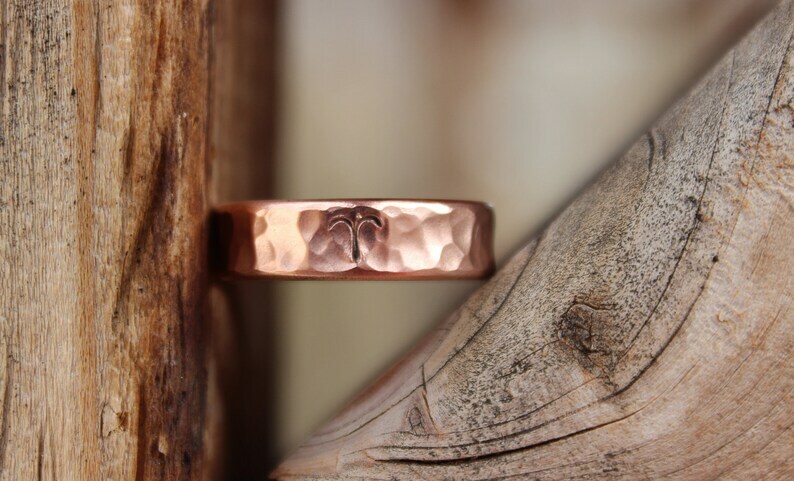 Made with 100% reclaimed copper, this wide copper ring makes a great eco gift to yourself or to another. Polished, this ring's surface picks up the raw copper tones from the sunlight. If you desire, I can leave your ring unpolished, which gives a natural, rustic and organic appearance. You also have the option to select a hammered finish...Just select your preference from the drop down menu upon check out. Hand stamped with your zodiac sign or left plain, this ringis a simple, yet bold design for both men and women. You can have more than just zodiac signs...you can select from the various images shown in the last photo! I also have anchors, and Greek letters. Just send me a message with your request. 1/4 inch (6 - 7 mm) wide band - may be slightly larger than this size. If you want a smaller width, just leave me a note in the message to seller upon check out. Please select your ring size from the drop down menu above. I'll get started right away on making your custom ring, but please allow me up to 14 days for each order. Thank you! Check out our handmade ring boxes...a total eco gift experience! I wish I could leave 5 more stars. Amazing quality and outstanding thought and time gone into this. Such a beautiful piece made and even better than I could have imagined. Very simple and easy to follow instructions and at an amazing price. forever grateful and impressed. No words can do it justice. Thank you for the small extra gift! Excellent ring, and great communication/timeliness on the order. Highly recommend! William made me a custom copper ring to honor my recently passed best friend. It is absolutely beautiful, a perfect tribute to the amazing person she was. I can not thank you enough William for the time and the love that went into making this ring that I will no doubt wear for the rest of my life.